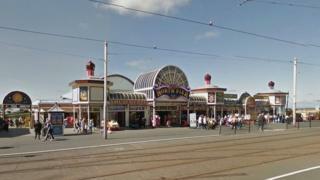 Blackpool's three piers have been included on a list of "cherished" worldwide monuments under threat. They feature alongside sites in Peru, Nigeria and New York on the 2018 World Monuments Watch list. The World Monuments Fund said the 19th Century piers were under threat from rising sea levels and extreme weather. Blackpool Council has had long-standing concerns regarding the structures and said it was delighted with the recognition. Council leader Simon Blackburn said the piers were "key flagships" for the town and described the list as a "call to action" which could offer "real opportunities for dialogue" with the government. He said the authority would now work on an action plan with the World Monuments Fund to "highlight serious issues and bring people back to the piers". "We need to ensure that through local and international collaboration they remain significant features of the town to be enjoyed by future generations," he added. Joan Humble, chairman of Blackpool Civic Trust said there were particular concerns about the future of the Grade II-listed North Pier, which suffered substantial storm damage in 2013. "We have to begin talking about what the future of our piers is for the next 100 years and how we protect them," he said. The National Piers Society estimates some 20% of piers are currently "at risk" of being lost. It said many coastal towns that have lost their piers "have struggled to maintain their identity as seaside resorts". Chairman Tim Wardley said the news was an "opportunity" for Blackpool "to lead the way" in helping to preserve other piers across the country.